PRODUCT: Portals Plus #12015 Retrofit Neoprene Pipe Flashing System, Fits Pipe Sizes 1 - 3 Inch Diameter. 5/case. Price/Case. APPLICATIONS: Neoprene Retrofit Pipe Flashings are used with HOT applied roof systems (built-up asphalt, coal tar pitch, modified bitumen, and cold process systems. Retrofit Flashings are for existing penetrations that can not be disconnected. DESCRIPTION: The Retrofit Flashing offers a quick and easy installation, eliminating roof leaks at pipes and other roof penetrations without disconnecting the penetration. Retrofit still allows for movement between the penetration and roof, while maintaining a perfect seal. The perfect seal is achieved with an integral tongue and groove closure, plus an overlapping flap, and is mechanically fastened with stainless steel hardware, which is included. Retrofit Flashings have excellent resistance to both ozone and ultraviolet degradation and a serviceable temperature range of -60F to +270F. Materials: Retrofit Flashings are available in EPDM for single-ply roofing and Neoprene for built-up asphalt, coal tar pitch, modified bitumen, and cold process systems. Small Pipe Adaptors: Insert adaptors for 3/8, 1/2, 3/4 and 7/8" OD pipes. 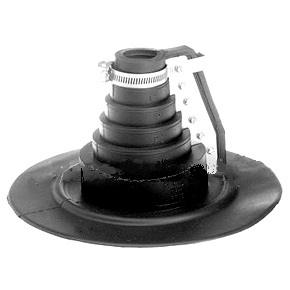 Large Flashing: Item 12025 together with optional adaptor rings for larger pipes, angle iron, square tubes.